Are domestic workers allowed to work in multiple residences? Under the existing Work Permit conditions, Foreign Domestic Workers can only be employed for the performance of domestic chores for their employers, at the residential addresses stated on the Work Permits. FDWs may only be deployed to work at another address if their duties in their employer’s home includes looking after the employer’s young children or elderly parents; and they are at the other address to continue their duty of looking after the employer’s young children or elderly parents. Employers can be charged for illegally employing or deploying a FDW. 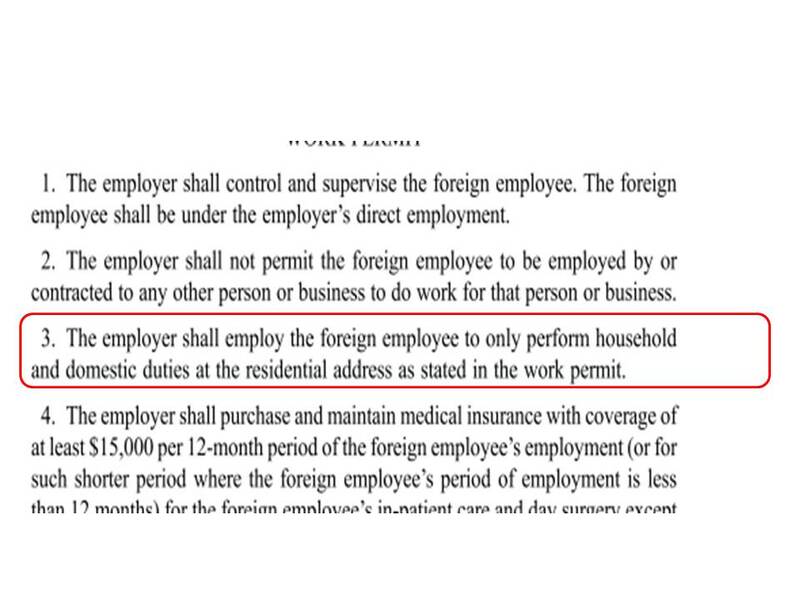 Employers who illegally deploy their FDWs can be fined up to $5,000. In addition, the errant employer will be permanently barred from employing FDWs. The $5,000 security deposit posted with the MOM might also be forfeited. For workers, if you encounter such a situation where you are being deployed at another residence under conditions not listed above, please do remind your employers of the consequences that might ensue.